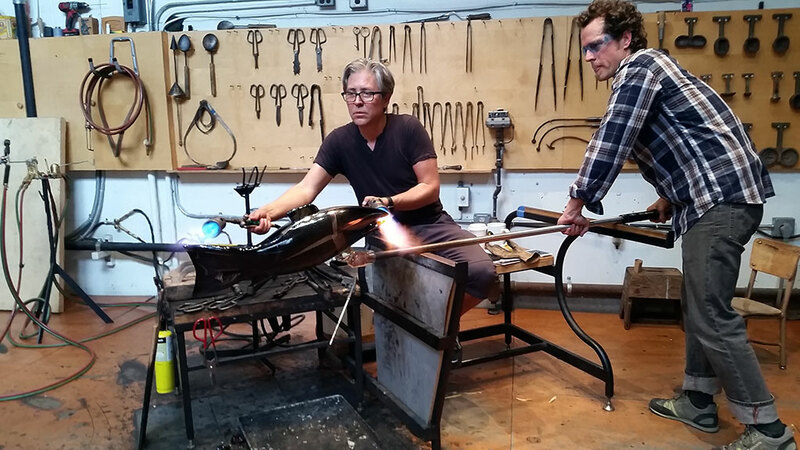 Seattle glass artists Dante Marioni and Preston Singletary collaborate on glass and talk about their friendship. Marioni and Singletary met in high school and have stayed connected, personally and professionally, ever since. Glass artist Preston Singletary talks about his heritage, how tools help to develop their art and culture over the years, and Tlingit symbolism. 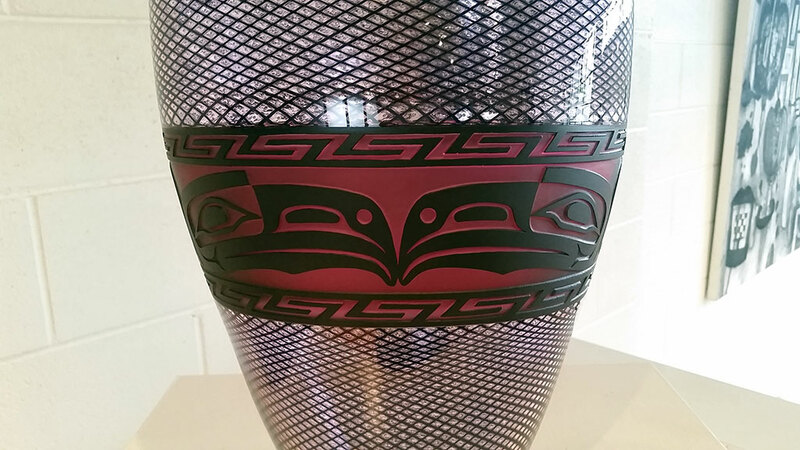 Preston Singletary is a Tlingit glass artist. 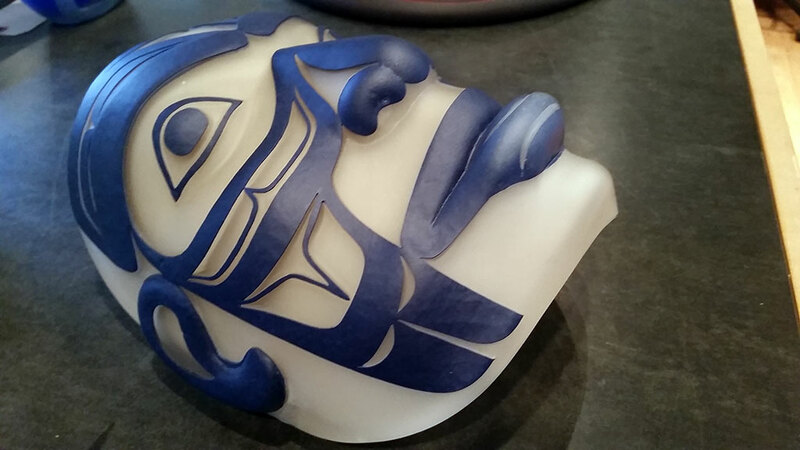 Singletary transfers Tlingit designs, traditionally carved in wood, onto glass. He studied at the Pilchuck Glass School in Stanwood, Washington. 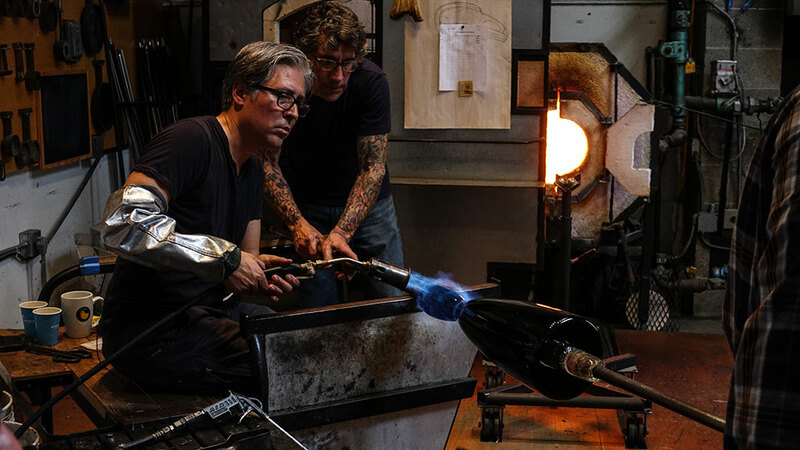 Light is integral to his work, and he uses it to add dimension to the glass and his design. His work is in the collections of the Corning Museum of Glass, the Heard Museum, the Museum of Fine Arts, and Seattle Art Museum. 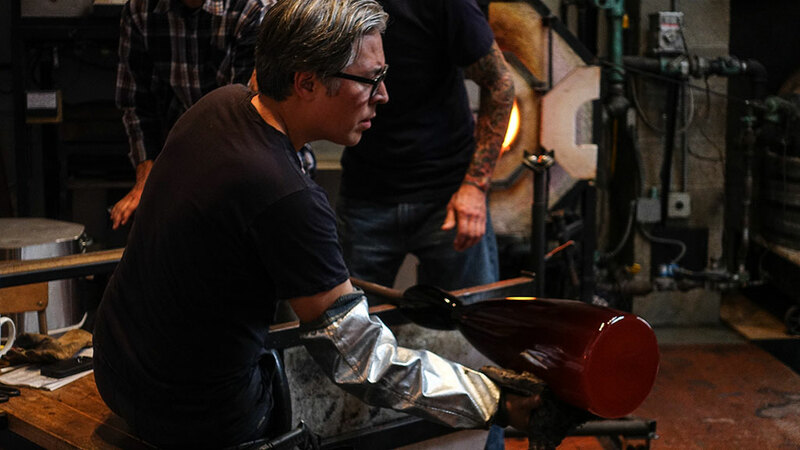 Preston Singletary is featured in the NATURE episode and included in the Pilchuck Glass School segment of the COMMUNITY episode as well as the Marioni segment of the FAMILY episode. Last week our schools had the privilege of experiencing a hands-on workshop with Catherine Alice Michaelis. 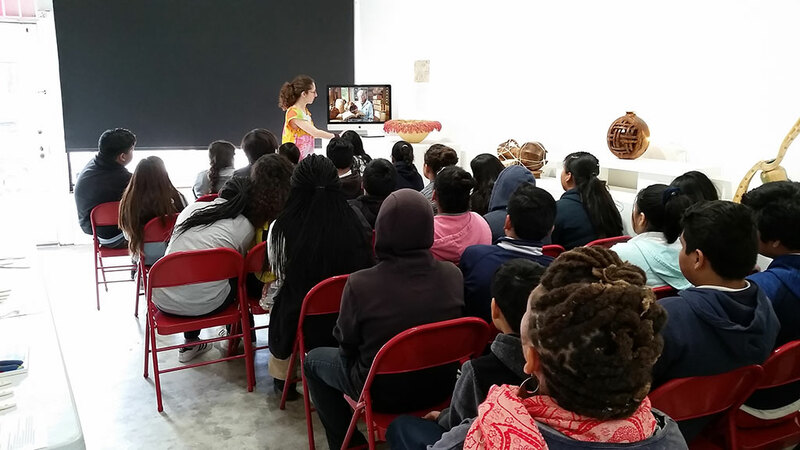 This week, the same students from Clinton Middle School and Rosewood Elementary were able to visit the Craft in America Center in order to view and discuss the objects featured in the NATURE episode in person. Monday morning, the Center welcomed dozens of middle school students through its door. 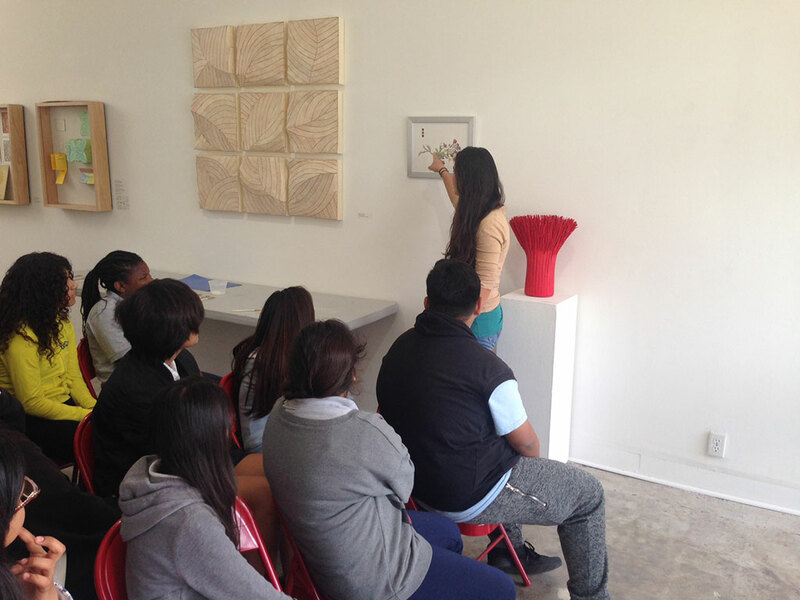 The entire class was given time to view the exhibition and talk amongst themselves. The conversations became louder, but once asked to speak about the exhibition, the students suddenly became quiet. Luckily, there are always a few smiling, and even giggling, faces just waiting to burst. We find that even though the older students tend to shy away from explaining why they enjoy a certain work of art, they are more likely to ask questions and to adeptly describe what a piece looks like to them. For example, for Mary Merkel-Hess’s Redfield, they asked “Why is it red? 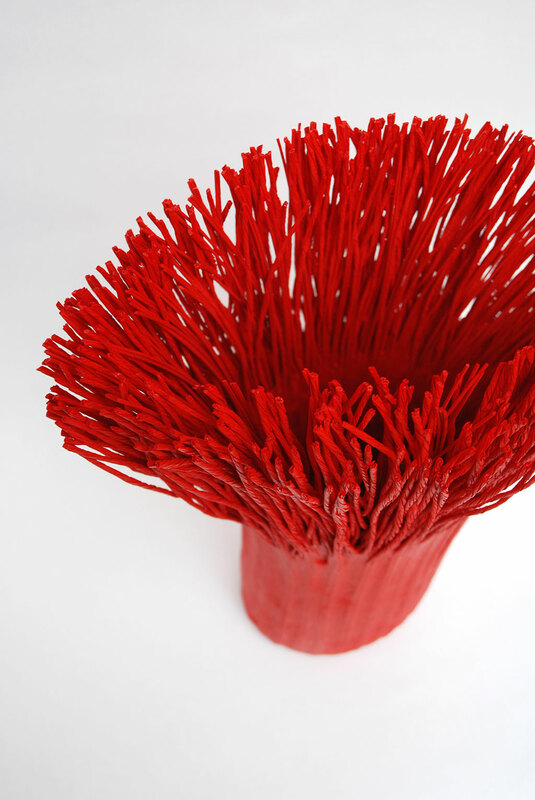 It looks like french fries covered in Ketchup.” Or Michelle Holzapfel’s Beginner’s Vase they asked “Is it a ladder? A chair? Is it both?” Their questions and opinions reveal a lot about their perspectives and exposure to art as viewers. On Friday afternoon we had the elementary students arrive at the Center ready to talk about Preston Singletary’s glasswork displayed in the front window. The 5th graders enthusiastically demonstrated a strong grasp of color and texture as they described the artist’s feather and salmon as round, smooth, curvy, bronze-ish, yellow, brown, clear, orange, and silver. After our very lively conversation involving visual thinking strategies, we watched clips from the artists in the NATURE show. The student’s “ooohs” and “aahhhs” reminded us how genuinely intrigued they are and how the artwork can inspire. Craft in America: NATURE premieres on PBS starting Friday, April 21, 2017. Here’s a list of stations airing the episode. 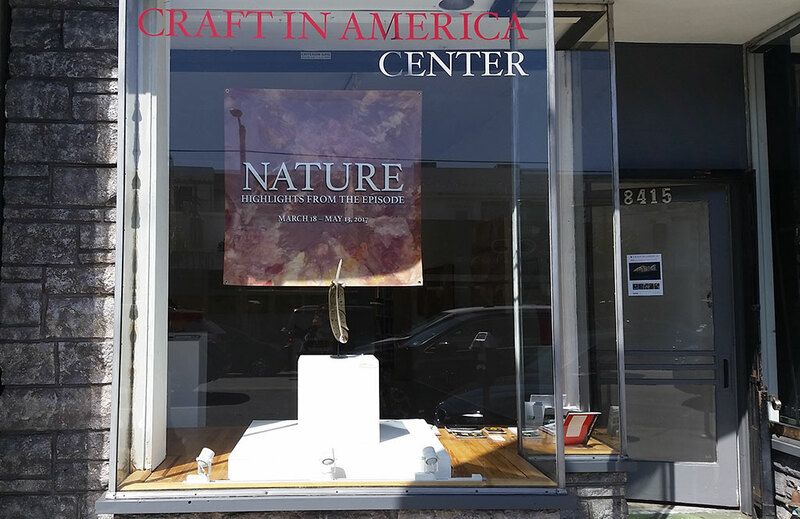 NATURE features sculptor Patrick Dougherty, fiber artist Mary Merkel-Hess, woodcarver Michelle Holzapfel, book artist Catherine Alice Michaelis, and glass artist Preston Singletary. In this lesson, students will view the Preston Singletary segment from the NATURE episode of the PBS series Craft in America. 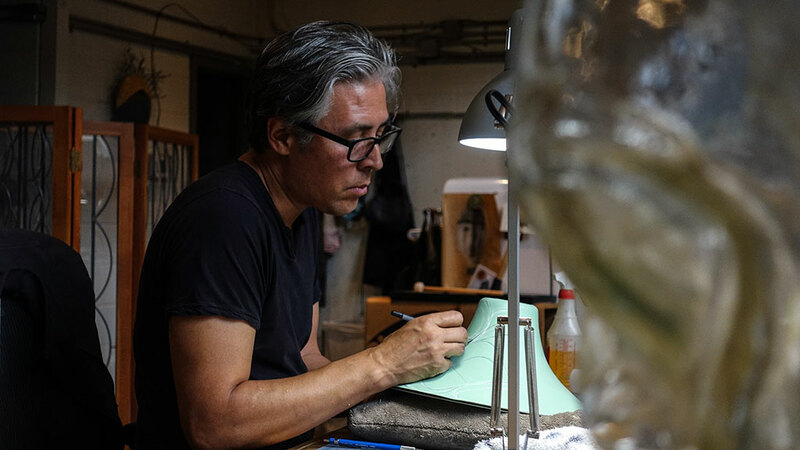 Students will hear from the artist, the team of assistants that help with his glasswork, and independent curator Miranda Belarde-Lewis, who is curating a show of Singletary’s work. 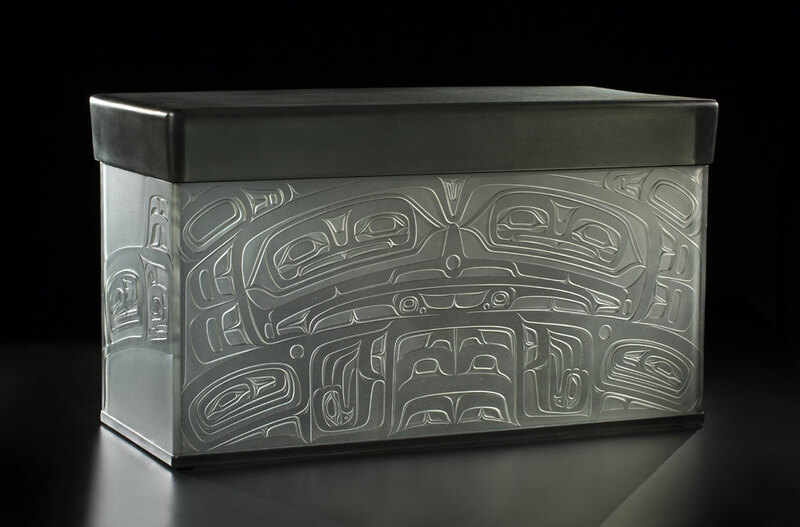 The program features the Tlingit origin story Raven and the Box of Daylight as well as information about traditional Tlingit art, customs, and philosophy. After viewing the episode, students will discuss Singletary’s work and the Tlingit people’s connections to the natural world. Students will also examine the ecology of art materials. In the studio portion of the lesson, students will choose a traditional tale and rewrite it as an ecological fable. Students will share the tale by crafting a diorama that includes found materials. 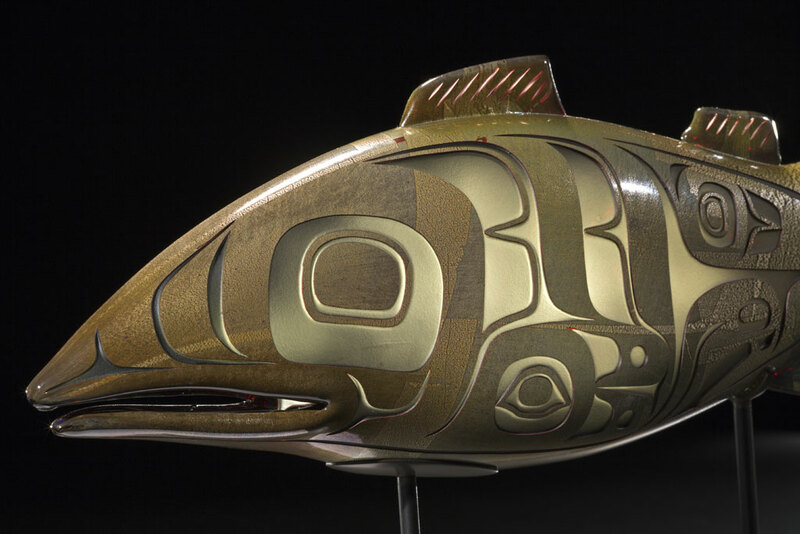 Native people are the best storytellers in the world because our stories carried knowledge. And that knowledge was needed to survive in a particular environment. Preston Singletary (b. 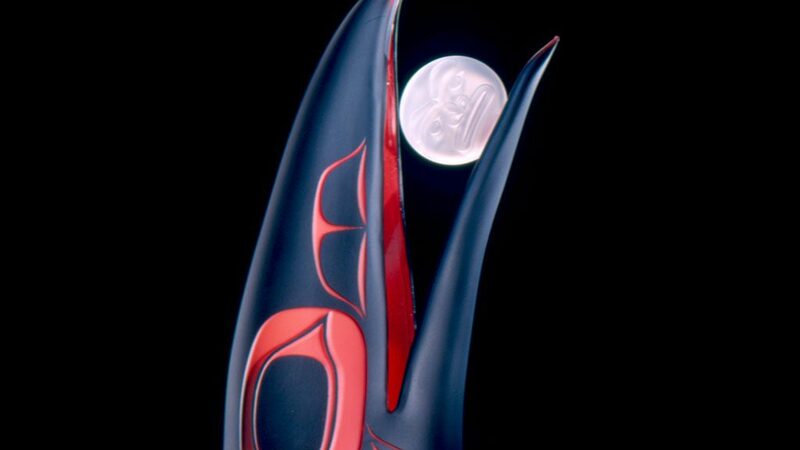 1963 in San Francisco, CA) is a Tlingit glass artist. 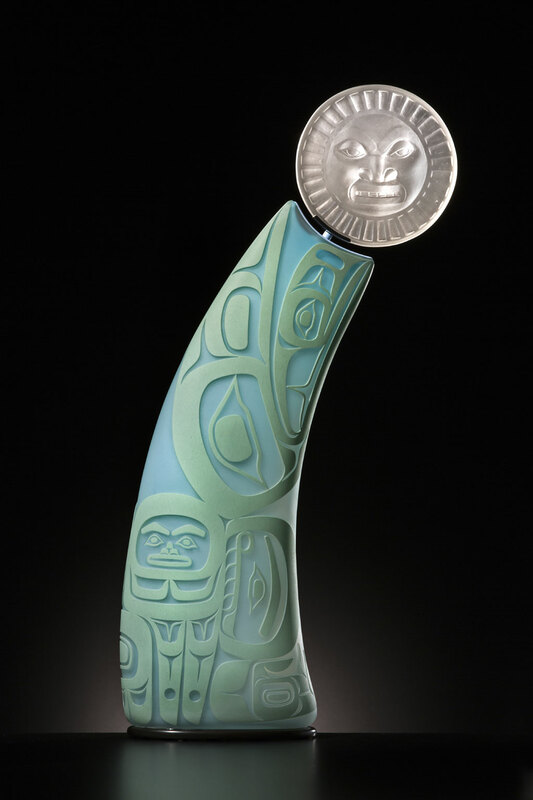 He studied at the Pilchuck Glass School in Stanwood, Washington. 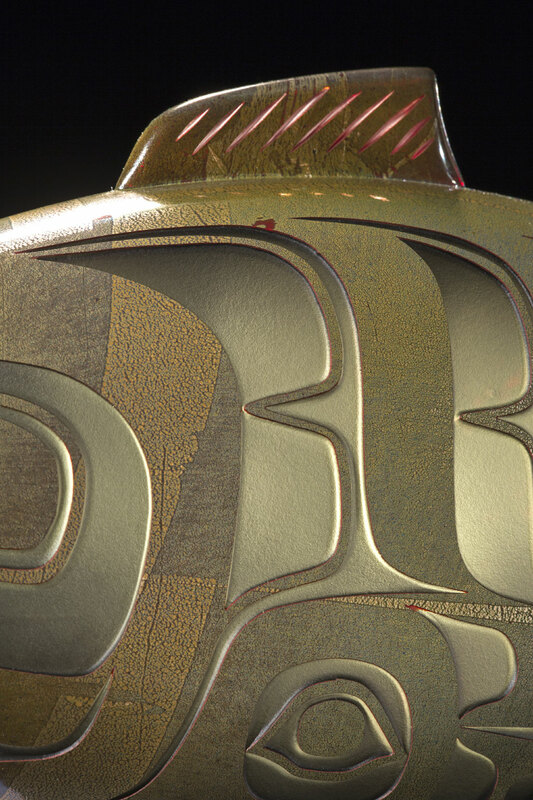 Singletary transfers Tlingit designs, traditionally carved in wood, onto glass. 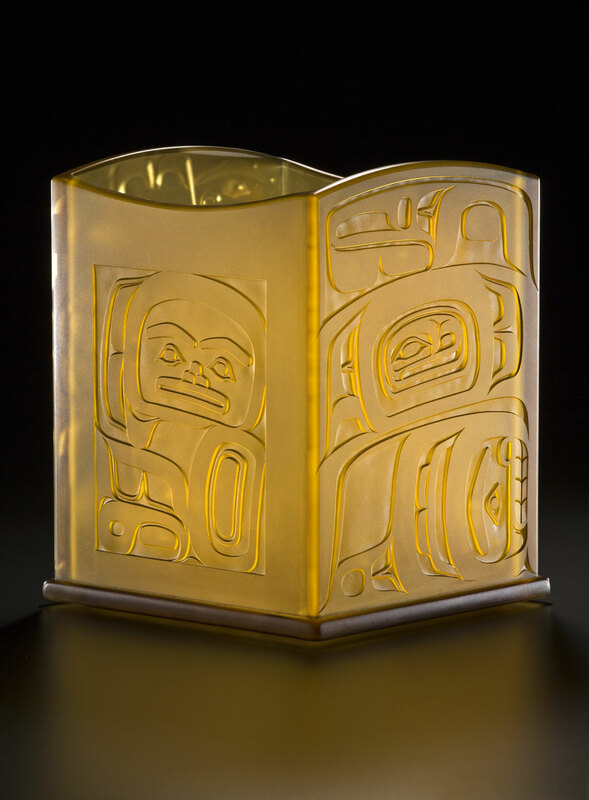 Light is integral to his work, and he uses it to add dimension to the glass and his design. Singletary is surrounded by the wild natural beauty of the Pacific Northwest Coast. 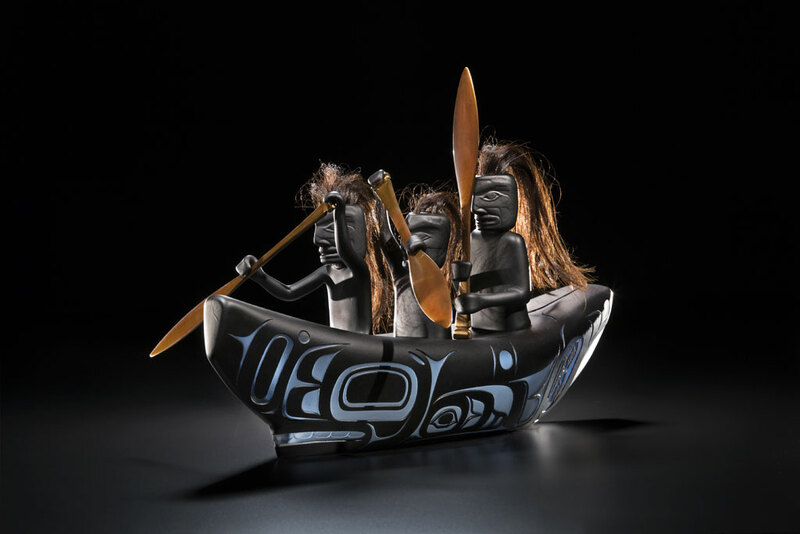 He captures the motion and magnificence of wild creatures in molten glass, then embellishes the cooled and hardened sculptures with symbols and designs from Tlingit culture. 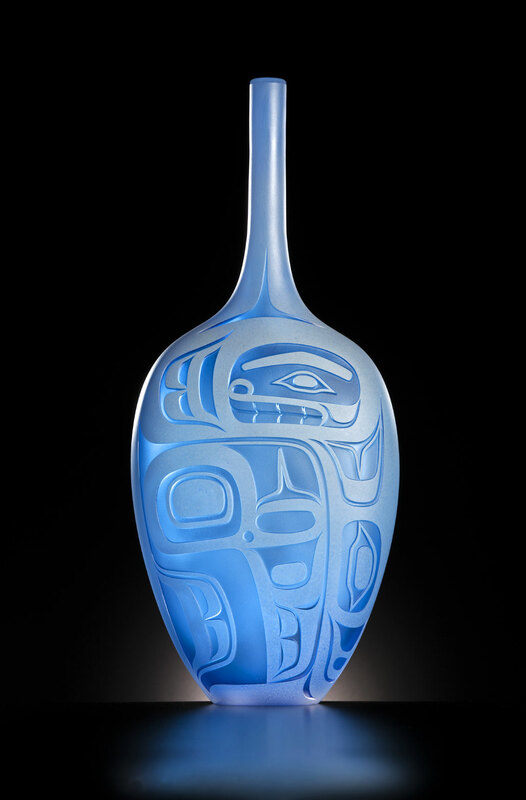 He is a pioneer, one of only a handful of Native American artists working in glass today. 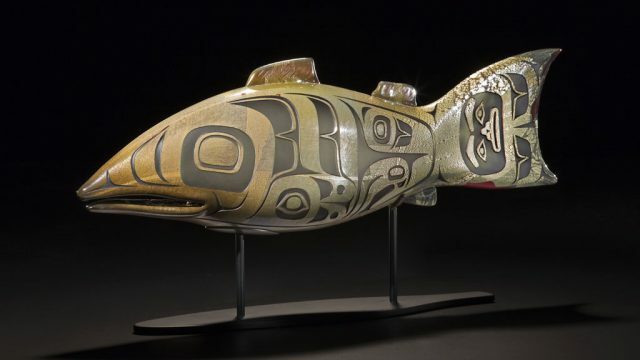 He explains as he works in his Seattle, WA studio, “When I began working with glass, I had no idea that I’d be so connected to the material in the way that I am. 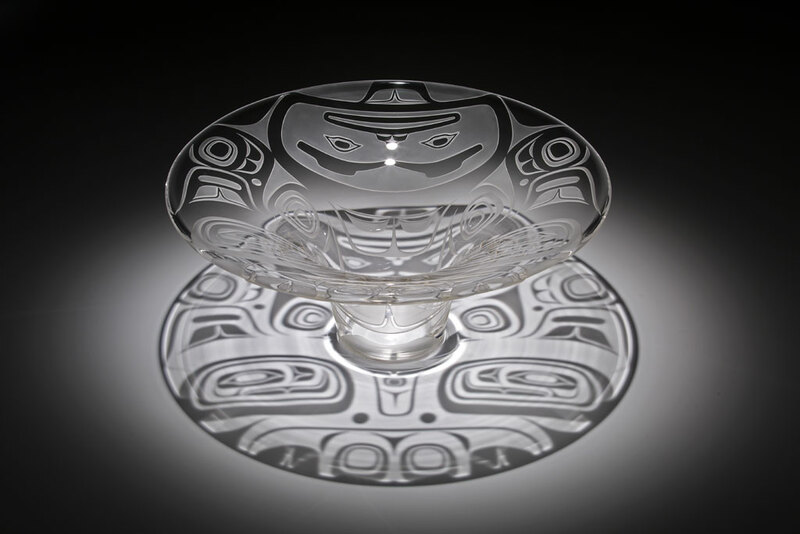 It was only when I began to experiment with using designs from the Tlingit cultural heritage that my work took on a new purpose and direction.” His work is in the collections of the Corning Museum of Glass, the Heard Museum, the Museum of Fine Arts, and Seattle Art Museum. Connection to environment and place can be a theme for artist’s work. 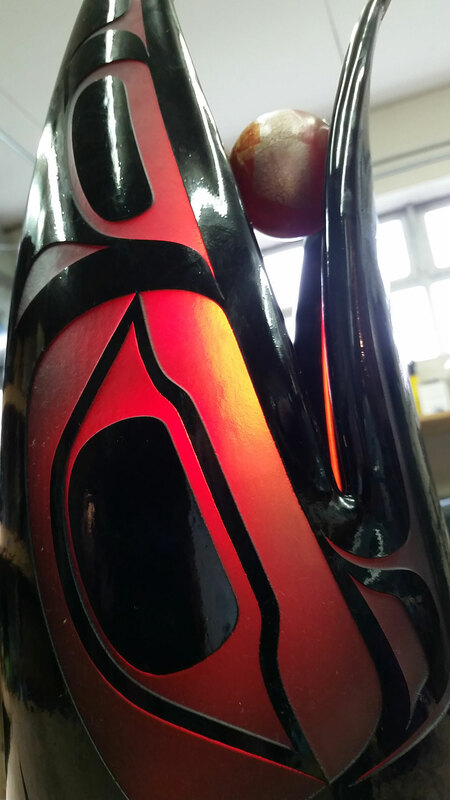 The art materials we choose have ecological significance. We understand our world through stories. Why is connection to environment and place an important theme for some artist’s work? 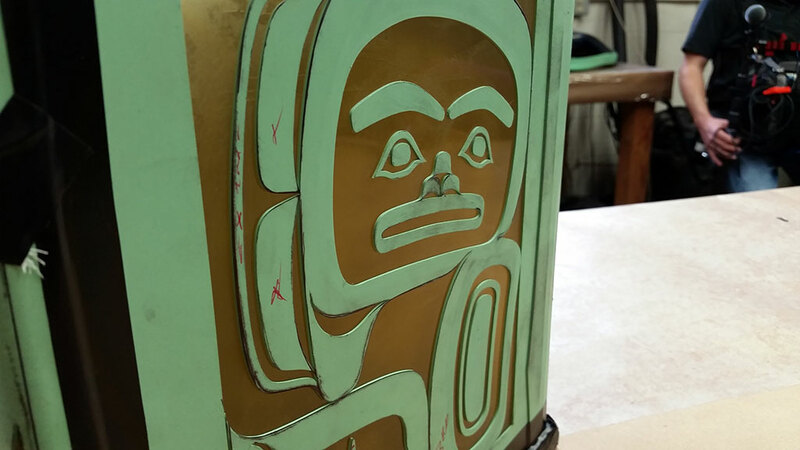 What is the ecological significance of the art materials we choose? How can telling stories enable (or limit) our understanding of the world? 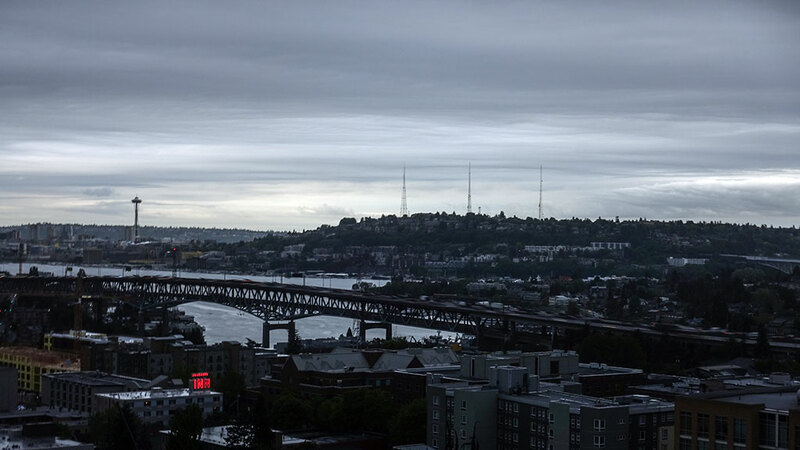 Understand that connection to environment and place can be a theme for an artist’s work. 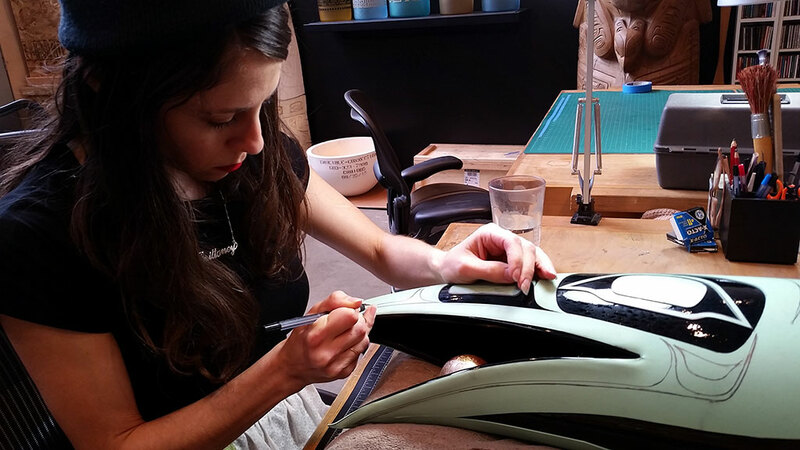 Research the sustainability and ecological significance of their chosen art materials. Develop an artwork that teaches the school community about an important family member or figure in the student’s life. 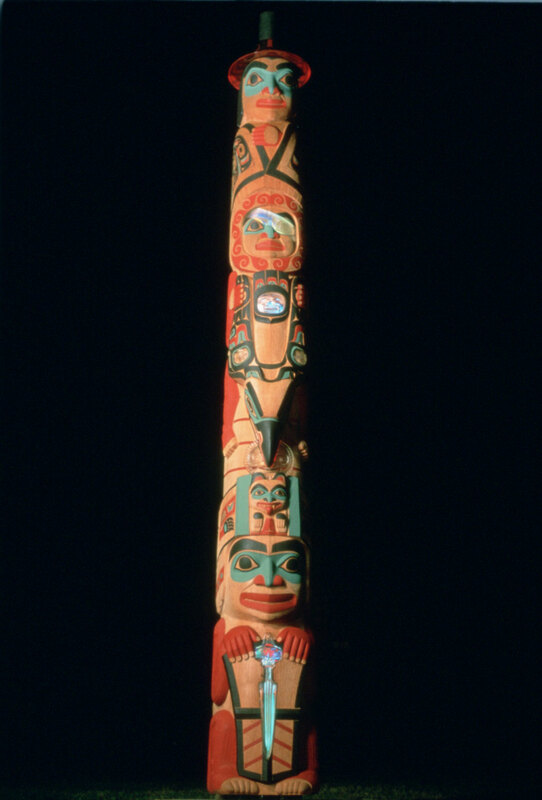 Tlingit, Zuni, sustainable, stagecraft, environment, indigenous, transformational, bounded space, curator, aesthetics, ambiguous. Technical Education: Students may choose to add to their story with video, special lighting of objects, and/or sound recordings, as Preston Singletary does in his show. Technical Education teachers may help to provide expertise and equipment for these plans. English/Literature: Origin stories may be a topic to explore with an English teacher, perhaps comparing origin stories from various books, cultures, and places. Science: Science teachers may help with determining the sustainability of artists’ materials in the classroom. 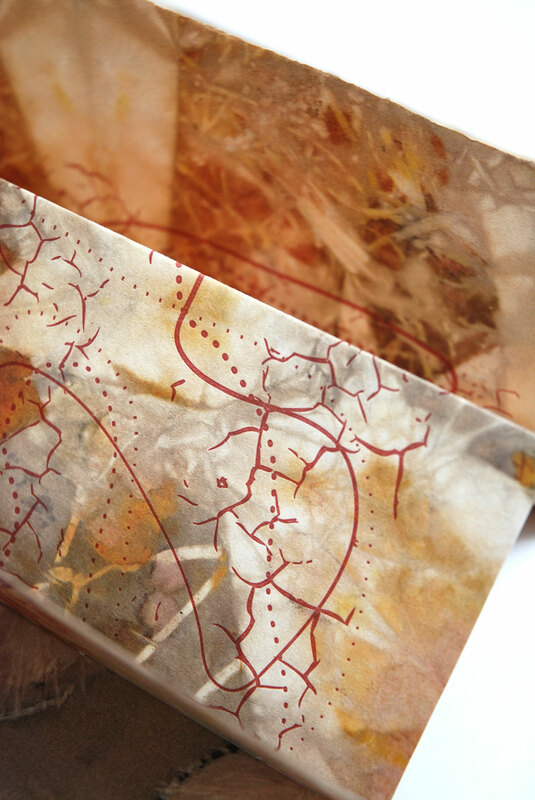 This topic could provide several lessons in itself: looking at the origin and ecological aspects of art materials. 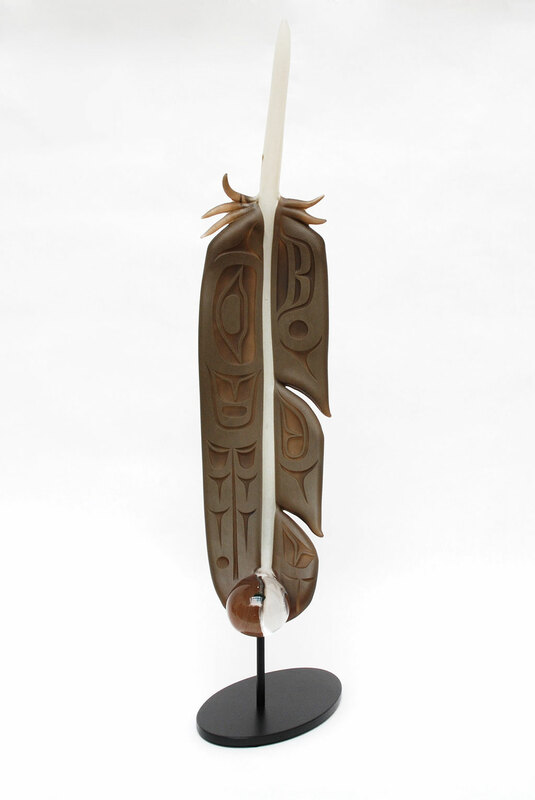 Process Component: Interpret Anchor Standard: Synthesize and relate knowledge and personal experiences to make art. Process Component: Investigate Anchor Standard: Organize and develop artistic ideas and work. 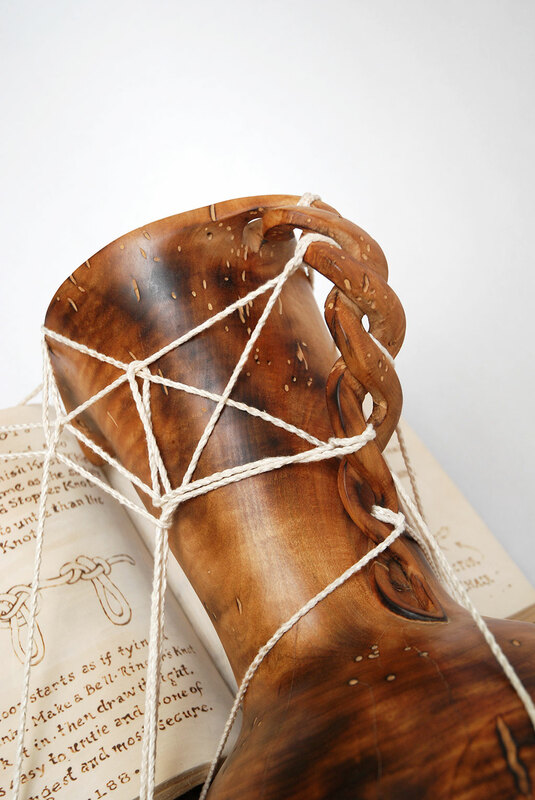 Process Component: Relate Anchor Standard: Select, analyze and interpret artistic work for presentation. Process Component: Analyze Anchor Standard: Convey meaning through the presentation of artistic work. 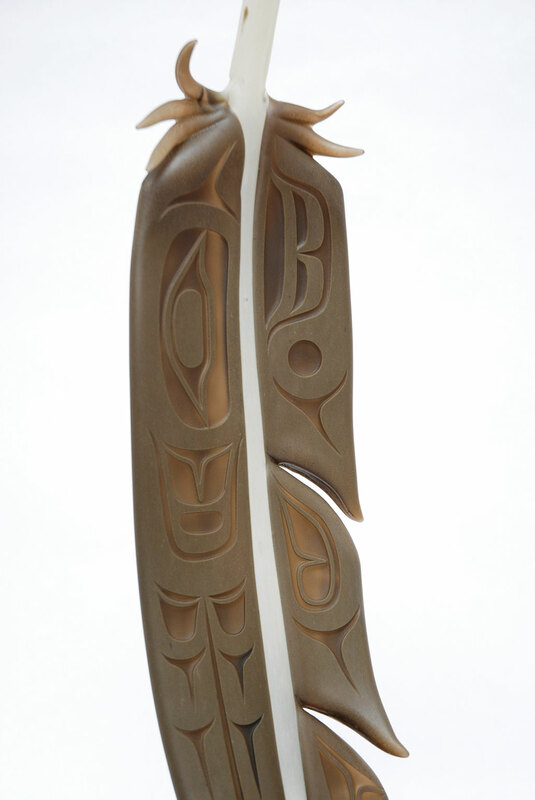 Process Component: Perceive Anchor Standard: Interpret intent and meaning in artistic work. Additional found materials: Encourage students to use recycled materials, including old worksheets and notes from schoolwork, scrap wood, fabric, scrap metal, scrap glass, cardboard, and packaging materials. Discarded objects from home and thrift store finds can be useful in diorama crafting. Students will take notes and make sketches (for later discussion) while viewing the content in the NATURE episode. After a class discussion of the video, students will use the worksheet Ecology of Art Materials to research qualities of some of the art materials they use every day. Later, during studio time, students will use the worksheet Crafting a Tale of Ecology to rewrite a traditional tale and create a diorama to represent the tale. How does Singletary describe his position as an artist? Why does he work in glass? What is a curator? (Students may look this up afterwards.) 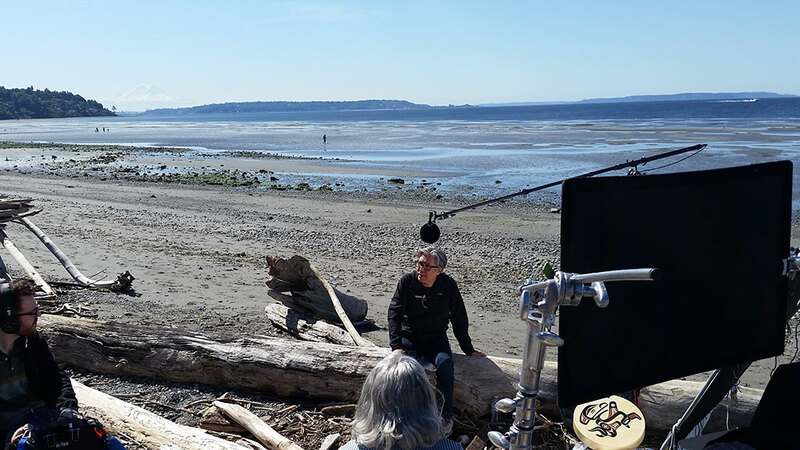 • What does storytelling provide for the Tlingit people? Is each piece of the show an artwork on its own? 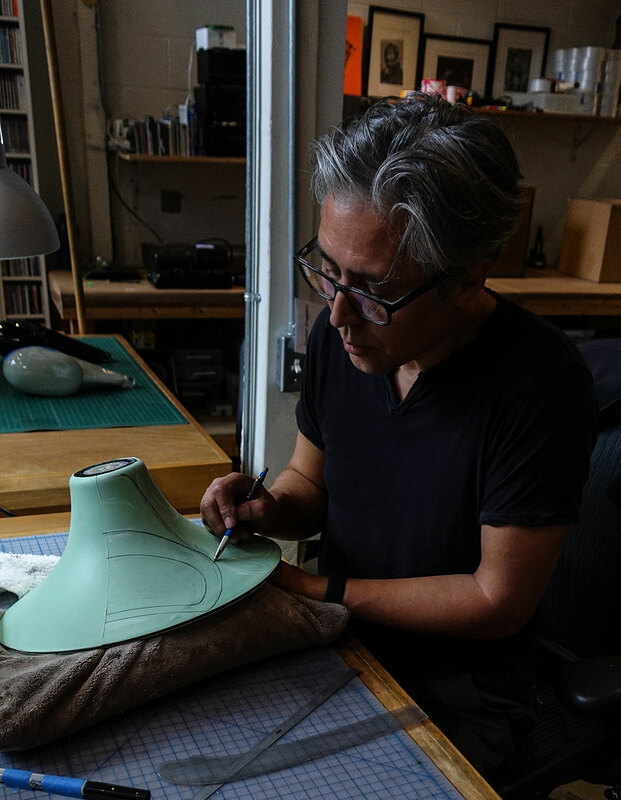 What does studio assistant Joseph BenVenuto say about the pieces? How important is environment to the artist and the curator? 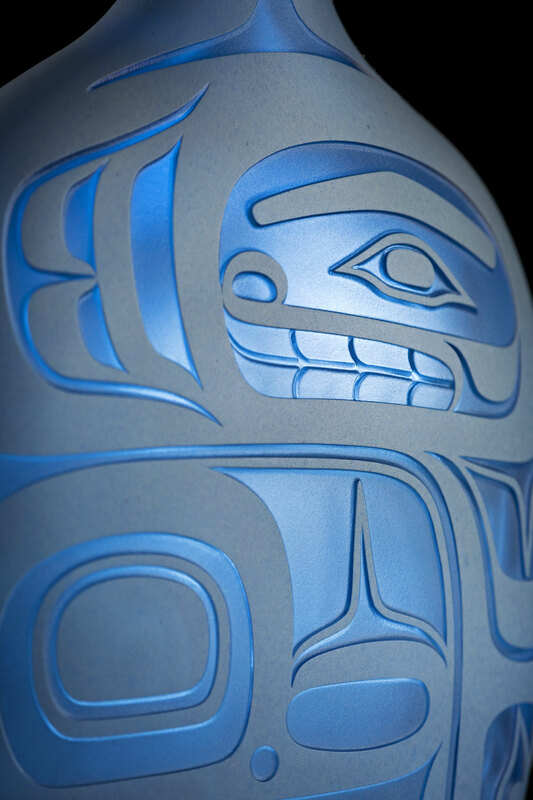 To the Tlingit people? What are the jobs of Singletary’s studio production team? What is the story of Raven and The Box of Daylight? Begin a discussion of the video. What did students find interesting? What questions do they have? Using students’ notes, discuss the information they gathered about the listed categories. Following are discussion ideas and potential answers to the questions above. How does Singletary describe his position as an artist? 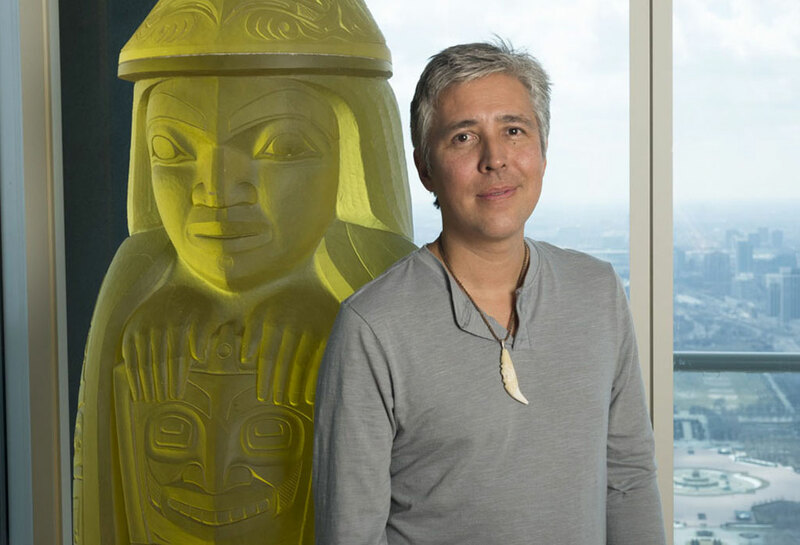 Singletary considers himself a bridge joining traditional Tlingit culture with new ways of sharing the stories and knowledge. Why does he work in glass? 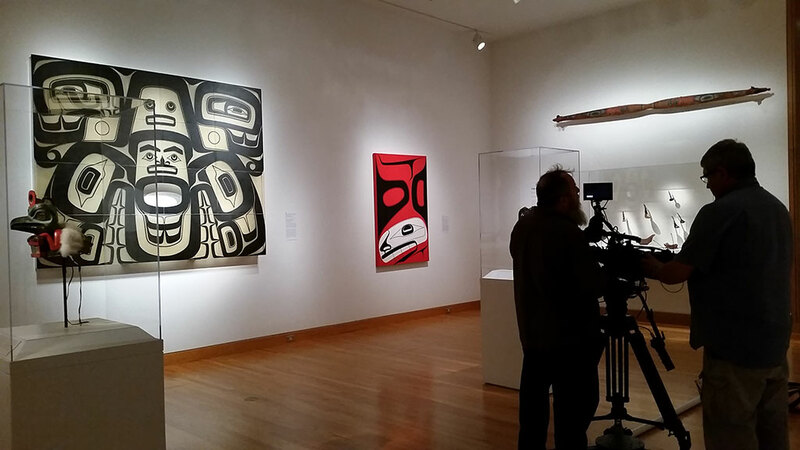 The artist notes that many traditional northwest materials are gone or in short supply. 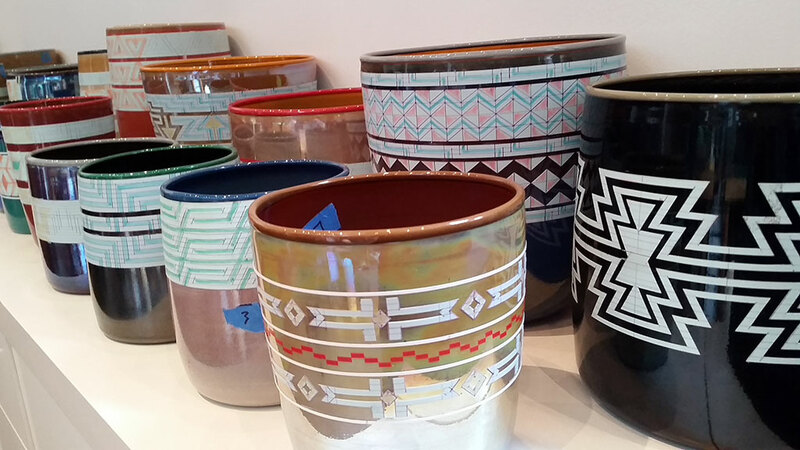 Introducing glass provides a new, plentiful material but also a new way of creating traditional art. What is a curator? After entertaining guesses, have students look up this word in several sources. Curators may be responsible for planning art shows, acquiring art for institutions, deciding what to exhibit, and caring for artworks. 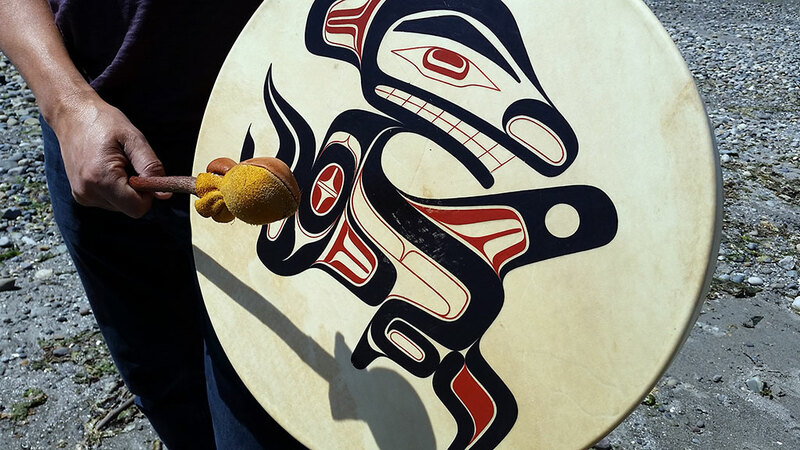 What does storytelling provide for the Tlingit people? 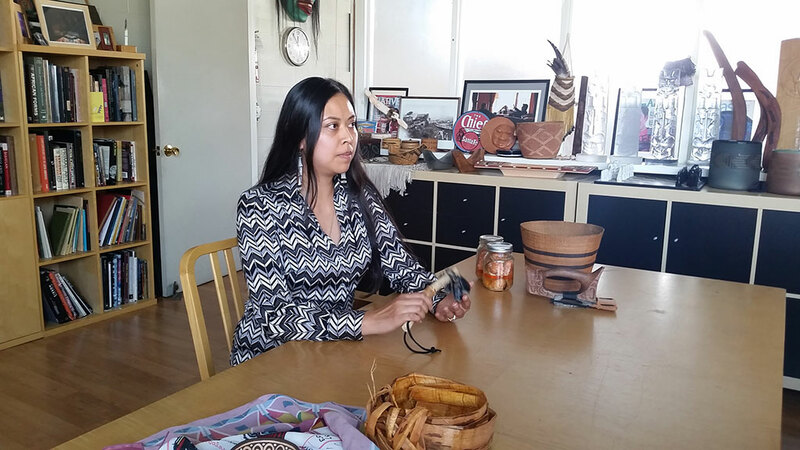 Miranda Belarde-Lewis states that “Native storytellers are the best storytellers in the world because our stories carried knowledge…that was needed to survive…” Also, environmental knowledge was passed along through storytelling. What is “bounded space?” Miranda Belarde-Lewis shares this definition from Apache philosopher Viola Cordova: “In Native American philosophy, bounded space is the natural environment one exists in; and the relationships one has with that space. 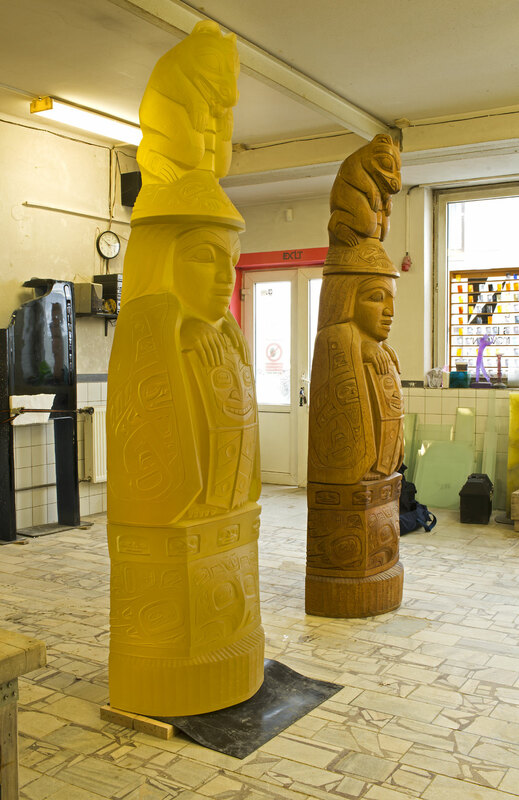 Cordova believed this space affects everything about a person: their language, culture, spirituality, and their aesthetics (how they believe something should look, or their ideas of beauty.) What do students think of this philosophy? Is each piece of the show an artwork on its own? 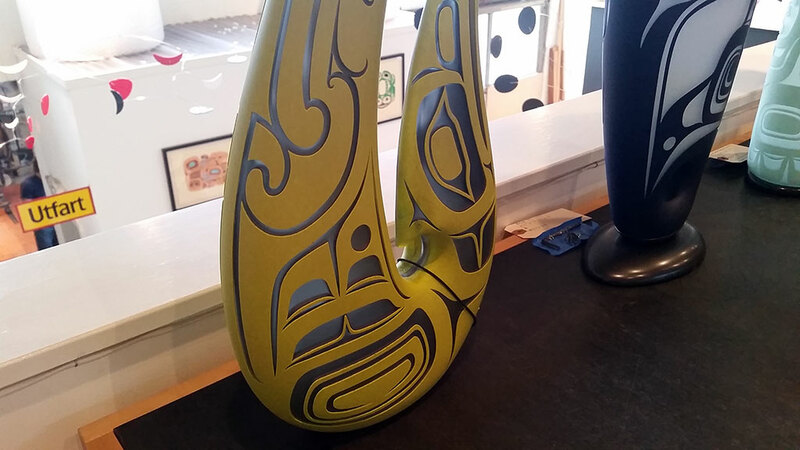 What does studio assistant Joseph BenVenuto say about the pieces? BenVenuto remarks that “One piece of his (Singletary’s) work is merely one line in a story.” This is a different view of art objects than the western view of each crafted object being precious in itself. This topic could be interesting to discuss with students. Have they ever crafted a piece that was part of a whole, and not complete in itself? How important is environment to the artist and the curator? 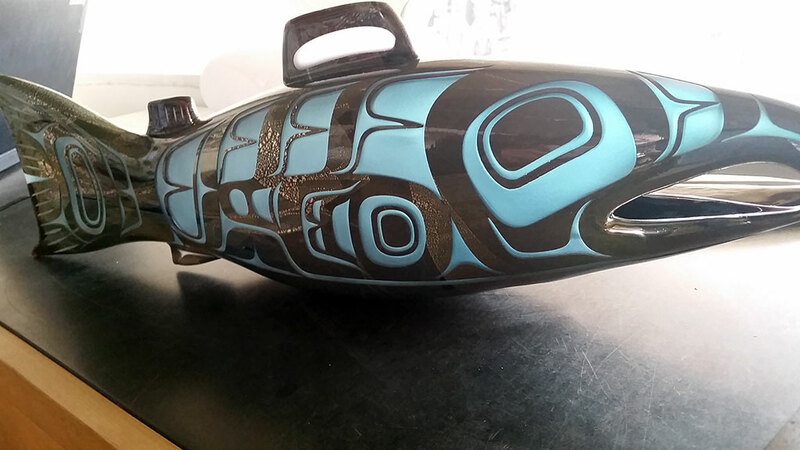 To the Tlingit people? Preston Singletary and Miranda Belarde-Lewis each comment on sustainability. For example, the preservation of natural species such as the cedar trees, used for canoes, baskets, and more was (and perhaps remains) essential to survival. What are the jobs of Singletary’s studio production team? 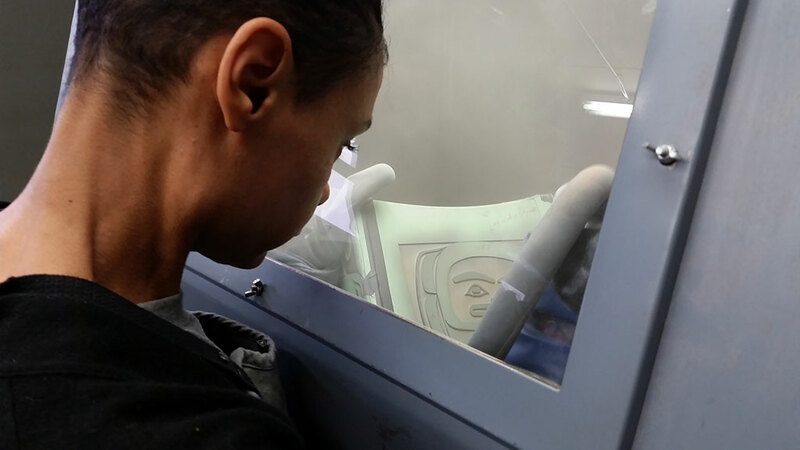 Encourage students to describe how they see studio glassworking assistants Sean Albert and Joseph BenVenuto, master cutter Brittaney Shanta, and sandblaster Terri Rau working. What is the story of Raven and The Box of Daylight? Have students tell the story. Ask them to look up versions of the story online. Does the story remind students of other stories they have heard? Discuss the term origin story and ask students to name other examples of origin stories. Have students research and share information in small groups. Then have the class share as a whole. Have each student responsible for creating one information card (such as a large index card) about one material that can be posted on a bulletin board for the education of all. The salmon is going to play a part sort of like stagecraft. I’ll have glass on the ground that looks like the river and these salmon are going to be kind of floating above the top. After using the worksheets, students should have ideas for stories they intend to rewrite and dioramas they can create. Story ideas could start with fairy tales, such as retelling Goldilocks and the Three Bears as Goldilocks wreaks havoc in the bear’s environment. Students may have stories that already include an environmental component, such as from blockbuster disaster films or from comics. Have students write the story in their sketchbooks and embellish the tale with sketched ideas for their dioramas. The diorama projects can vary according to students’ ideas. Some students may have traditional crafts practiced in their family that can become part of the scene and add more meaning; for example a knitted landscape. Students who camp, fish, hunt, or practice outdoor sports might want to include references to those family traditions in their story and their diorama. To make a diorama, begin with a box set on its side to form a small “stage.” Prime the box by covering it with paint, paper, or fabric inside and out. Set the scene: Like stagecraft, add a background, and flooring base. Position characters and props by gluing found or crafted pieces in place. Consider the outside of the box as well as offering several surfaces for further treatment and visual embellishing of the story. It will also be enhanced by video, projecting onto glass and creating sort of a backdrop. I wanted to create this atmosphere of the northwest coast, with this mist rising out of the trees. It would transform the viewer into another place. 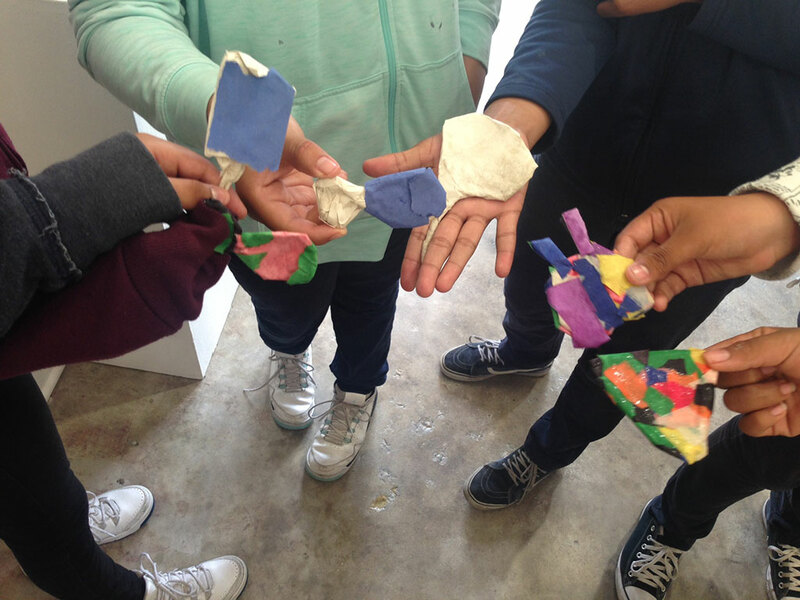 Encourage students to work with each other to curate a show of what they have produced. They can decide on whether the exhibit should be brief or extended, where it should be placed, how it should be arranged. Do they think there should be video or recordings to accompany the show? Singletary talks about stagecraft and theatrics as a way of telling stories. 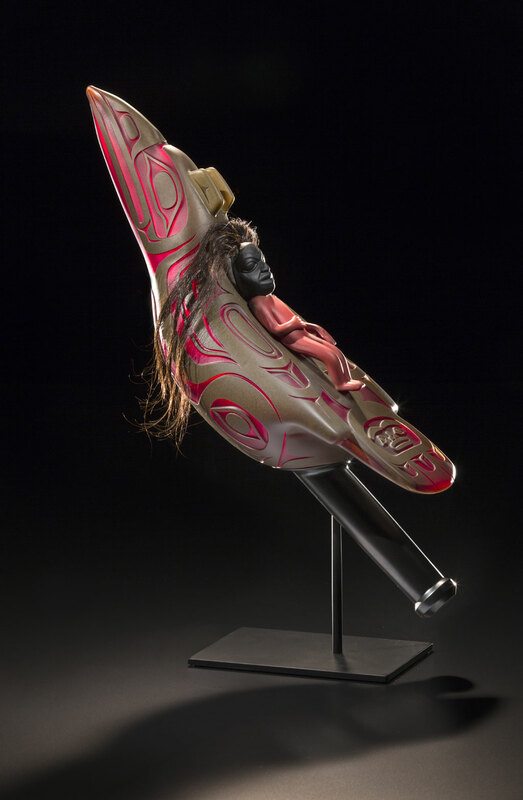 He mentions having the story told in the Tlingit language playing in the background of his show, adding a layer of ambiguity for those who do not speak the language, yet adding to the “authentic” experience of the northwest. Students may want to consider these ideas in their own show planning. Understands that connection to environment and place can be a theme for an artist’s work. 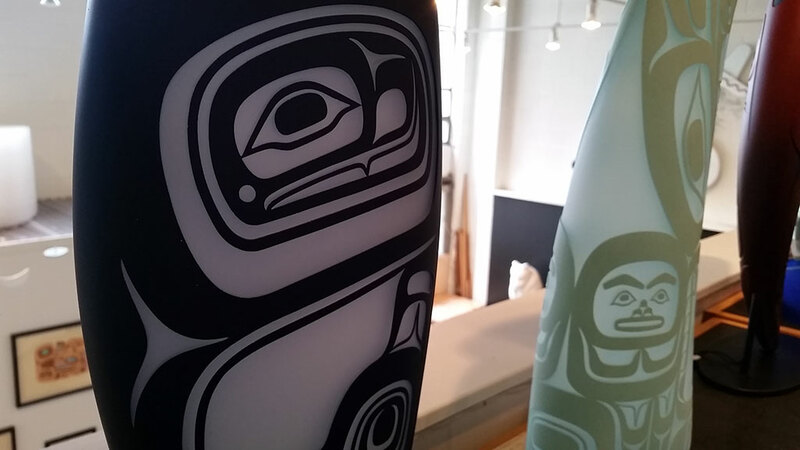 Researched the sustainability and ecological significance of their chosen art materials. Rewrote a traditional tale including an ecological metaphor and presented the story in a diorama. Glasswork: Setting up a lampworking studio in the classroom is not inexpensive but a possible option with fundraising. 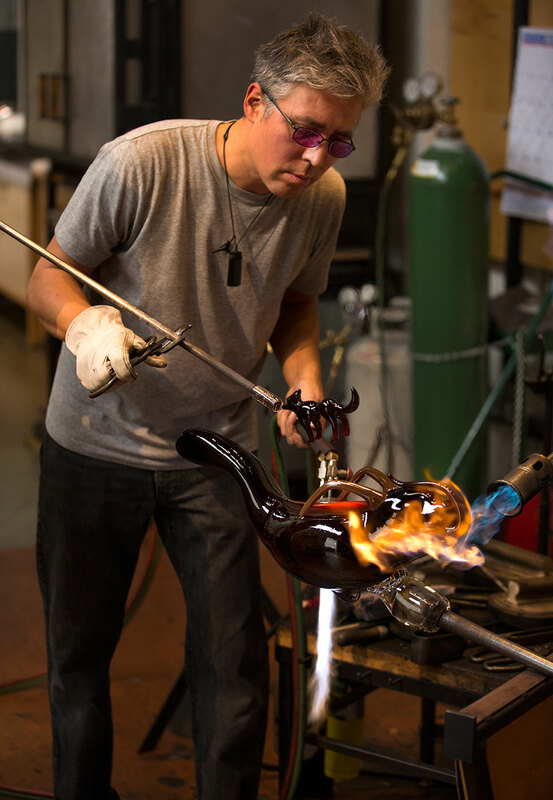 Lampworking allows students an experience sculpting small projects (such as beads) with molten glass. NATURE: Highlights from the Episode opened on Saturday, March 18. All but one of the works in the show come directly from plants, but all of the works very much relate back to the theme of the episode: exploring the beauty and wonder of the natural world. 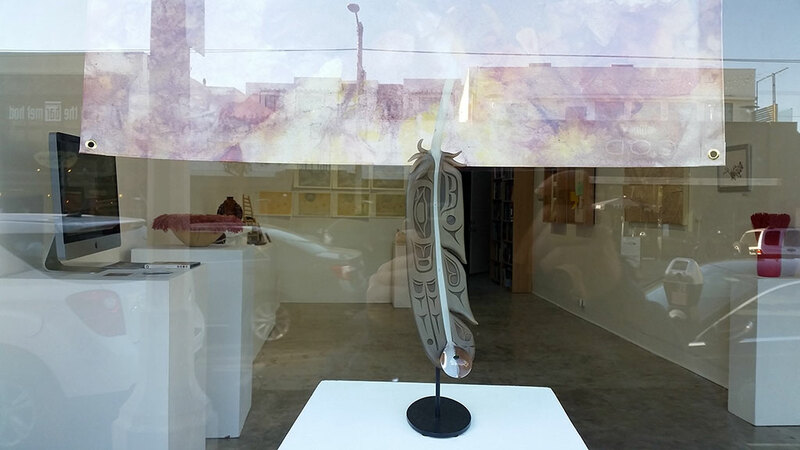 Preston Singletary’s glass interpretation of the Tlingit creation myth sits in the window, allowing the piece to be enhanced by the changing light throughout the day. 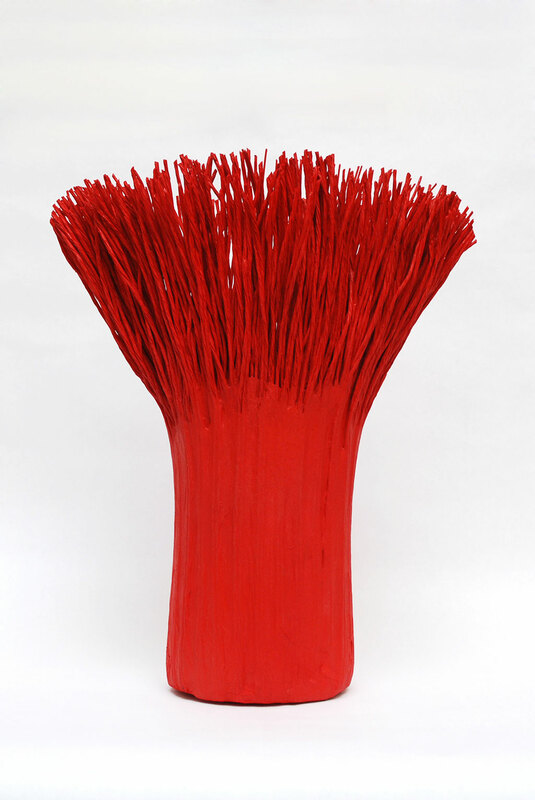 Two grass-like vessels by Mary Merkel-Hess frame the doorway with their bright red fronds alluding to the grasses that influenced the works as her 9-piece leaf work adds a movement that is naturally dynamic, but motionless all the same. 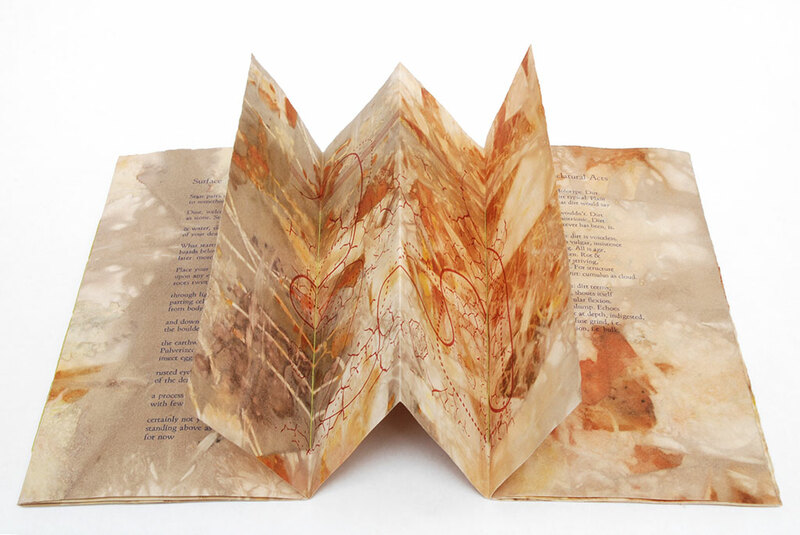 There’s such a wonderful intimacy about artists’ books, and Catherine Alice Michaelis uses both subject matter and process to showcase her connection to the land. 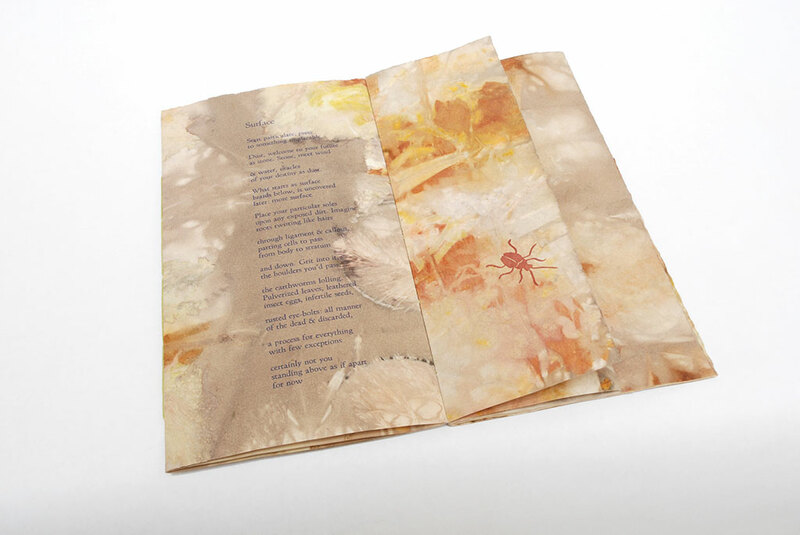 In some of her pieces, she uses a process called eco printing to dye paper using found local plants. 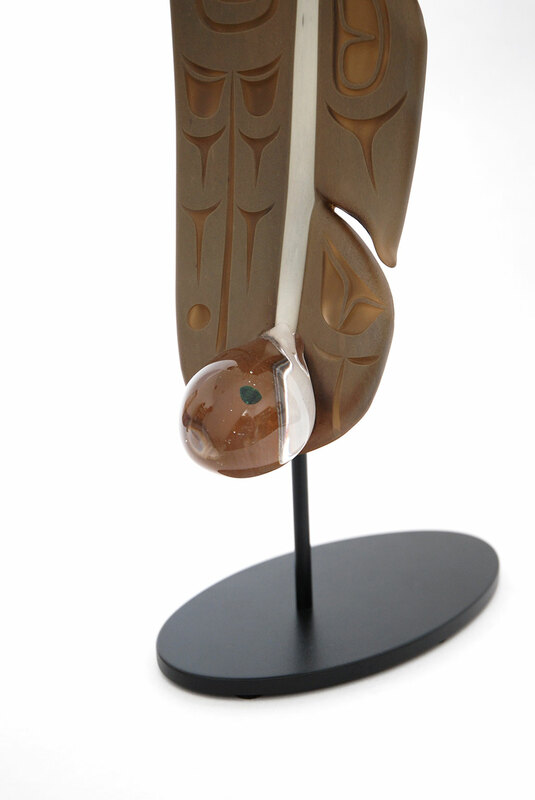 Interspersed throughout the show are Michelle Holzapfel’s carved wood pieces. 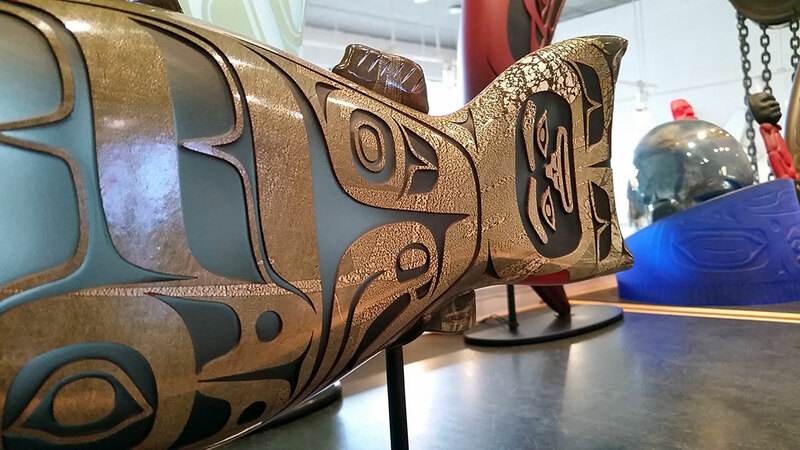 While not only impressive from afar, these pieces are so interwoven and intricate that it is important to see them in-person. 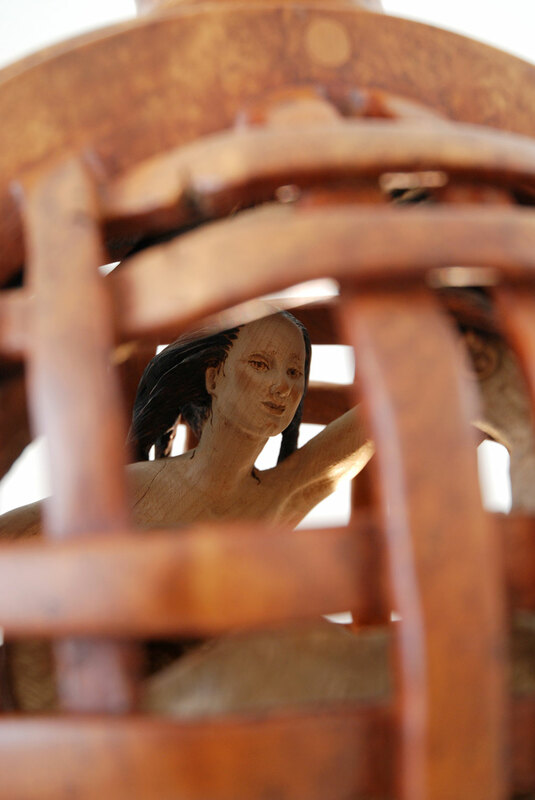 You can find out more about Singletary’s mythological sculptures, Michaelis’s eco printing, and just how Holzapfel persuades the wood to fit together so precisely by visiting the Craft in America Center and by tuning into NATURE when it premieres on PBS on April 21st (*check local listings).